I was an Apple TV early adopter back in the day when the Apple TV had an actual hard drive in it. With the latest version of the Apple TV, I have found that it takes a lot longer for movies and tv shows to start playing. It is often that a video will buffer for a while which interrupts our viewing. The Apple TV no longer has a hard drive inside for storing content. It has a small amount of storage that it uses as a buffer to keep your content playing smoothly. The problem these days is that movies and tv shows stream in HD and those HD files are quite large. On top of that, we have multiple devices that are connected to our Wifi network which makes the router work harder to transmit the signal the Apple TV needs to stream content uninterrupted. Due to the layout of our previous home, it was easier to connect the Apple TV over Wifi. We could not get our cable internet modem or router close enough to the TV to connect the Apple TV by ethernet cable. About 6 months ago, we moved and I decided to place the cable modem and router behind the tv. We instantly had the same issues as before with buffering and the Apple TV becoming disconnected from the Wifi signal. This prompted me to just plug the Apple TV in directly to the router using an ethernet cable. Having the Apple TV plugged in directly solved the problem immediately. 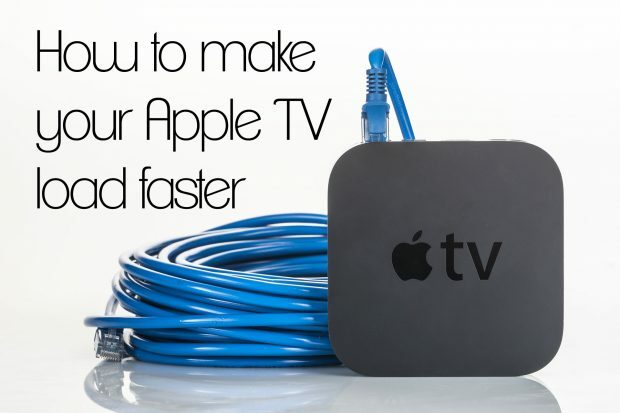 The Apple TV has 802.11 N, but that just is not fast enough to stream high-quality HD video while multiple other devices are connected as well. Removing the need for the Apple TV to use the Wifi network, it made the connection faster. On top of that, ethernet is still faster than Wifi. Thankfully I was able to place my cable modem and router behind my TV in this house. Had I not, I would have had to get more creative. In my office, we have two Apple TV’s. Unfortunately, both are connected via Wifi and we always have connection problems with them. Here are a couple of options I was considering at my old home and am considering at my office where running a direct ethernet cable from the router to Apple TV is not an option. Option 1 – N for the Win! The Apple TV supports 802.11N which means if you have a wireless router that is older/cheaper that does not support 802.11N, your transfer rates to the device will be slower. Hypothetically, 802.11N should be more than fast enough to stream HD content. Before getting carried away with the options below, you might try upgrading your router to a higher quality Wifi router. After not being content with the Apple Basestation Wifi Routers I switched to an ASUS RT-AC66U which supports 802.11AC and N. My Macbook Pro supports 802.11AC, which is more robust than N. It also has four Ethernet ports in the back. I used one of those ports to plug my Apple TV in directly. Using this router, I noticed more consistent connections with my other wireless devices then when I was using the Apple Basestation router. Most cable modems have more than one ethernet port coming out of them. If not, the router you use most likely does. This gives you the ability to separate the Wifi signal to your Apple TV from the wireless signal you use for other devices. This would mean that you would have to purchase another Wifi router to accomplish this. With two Wifi routers, you could dedicate one for connecting to your Apple TV and the other for all of the other wireless devices in your household. Let me explain this in more detail. If your modem has more than one ethernet output port on it, you can plug each of the Wifi routers into the modem directly. Configure your second Wifi router with a password and connect your Apple TV to it. You can leave your other Wifi router alone and continue to use it for your other wireless devices. 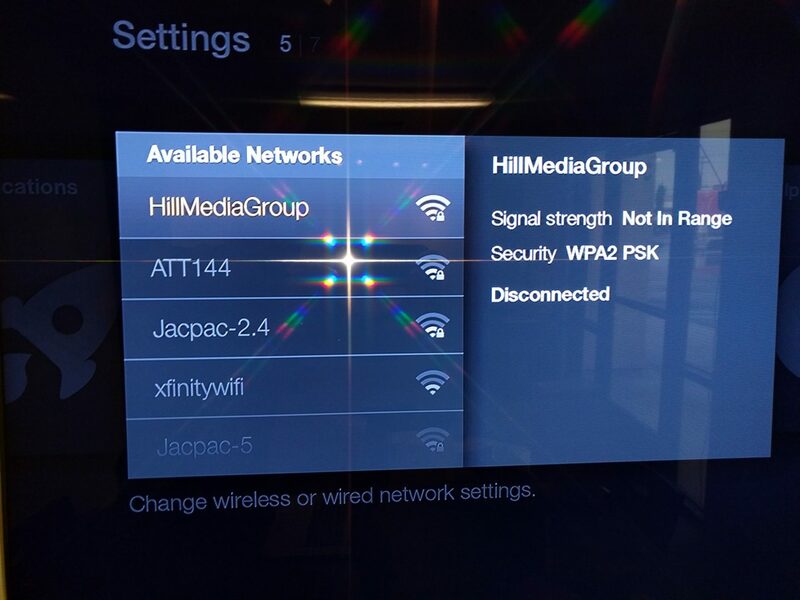 Pro Tip: Most Wifi routers allow you to hide your network from being found by other devices. Since it will only be serving your Apple TV, you can hide it. When you go to connect your Apple TV to it, you will have to manually type in the network name because it will be hidden from being found automatically. I would use something like the ASUS RT-AC66U as your main router serving all of your wireless devices and the ASUS RT-N12 for your Apple TV. If your modem does not have more than one ethernet port, you will need to connect your second router to the first. Consult the user manual of your wireless router on how to use it in passthrough mode. Did you know that you can wirelessly transmit an HDMI signal? Well, you can. Using the Nyrius ARIES Wireless HDMI Transmitter & Receiver you can transmit the signal from your Apple TV to your TV wirelessly. This means that you can place your Apple TV close enough to your router so that it could be plugged in directly to the routers ethernet port. The Nyrius HDMI unit transmits a solid signal up to 30ft. The Apple TV in my old office was located 90 degrees and about 15 ft back from the TV, so it was mildly annoying to have to point the remove in a different direction than the TV. It took some getting used to, but it worked. One would assume that Apple will update the Apple TV one of these days and it will most likely sport 802.11AC. At that point, our streaming woes should be over, that is until 4K video becomes more accessible and available to stream. For now, I will keep my Apple TV connected via ethernet cable because it is allowing me to enjoy fast loading video content and I have yet to have it buffer on me. Husband and father extraordinaire. Loves Jesus. 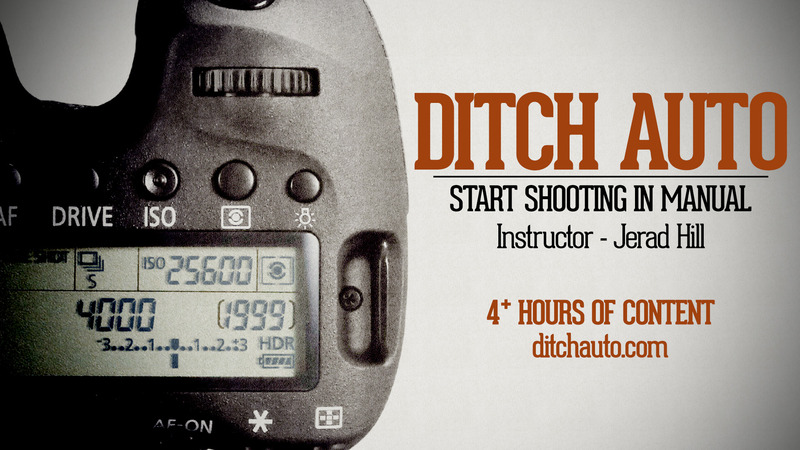 Spend the rest of his time as a photographer, website designer and entrepreneur.